This morning when I filled my electric teakettle with tap water, I didn’t think of that liquid as anything but friendly. I know, though, that in many places, what pours from faucets, sits in reservoirs, or pools in streams is full of harmful organisms; for 900 million people around the world, the water they drink, cook, and wash with is unfriendly. A few Quakers from Olympia, WA, are trying to change that through an organization called Friendly Water for the World. The nonprofit’s mission is straightforward: to expand access to low-cost clean water technologies and information about health and sanitation to people in need of them. The organization grew out of collaboration between theologically diverse Quaker congregations in two Washington communities—Olympic View Friends Church in Tacoma and Olympia Friends Meeting, Olympia. Although Friendly Water for the World is committed to Quaker testimonies of simplicity, peace, integrity, community, and equality, it is non-denominational and welcomes individuals from other faiths and traditions. Its approach involves partnerships among individuals and communities, working and learning together. And work and learn they do, in Kenya, Burundi, India, Ethiopia, Afghanistan, Uganda, South Sudan, Zimbabwe, Honduras, and Haiti. The learning begins in North America, with week-long workshops teaching volunteers how to build and teach others construction techniques for BioSand Water Filters. This simple, affordable technology uses local sand and gravel in a small container suitable for people’s homes. For about $50, a household can have a system that lasts 30 years. Here’s how it works. 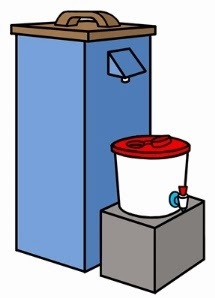 Contaminated water (from any source, including rivers, wells, and rainwater) is poured into the top of the biosand filter at least once daily. Water slowly drips through a diffuser and flows down through the sand and gravel. Treated water flows by gravity out of the outlet tube. Disease-causing organisms (95-99% of them) are removed through biological and physical processes that take place in the sand, resulting in 12-18 liters of filtered drinking water per hour. To add to the filter’s effectiveness, Friendly Water also works with local leaders to promote personal and community sanitation practices to assure filtered water isn’t contaminated before use. As I pour water over my freshly ground coffee, I’m aware of how privileged I am to do so with such ease. I’m grateful to all the folks helping to make this a more friendly process in many places around the world. Iris, thanks for this. I'm going to look into Friendly Water some more. I'm also curious about the Friends Church in Tacoma–do you know where exactly it is?